In 2-gallon resealable food-storage plastic bag, mix all ingredients except pork chops. Add pork; seal bag and turn to coat. Refrigerate 1 to 2 hours to marinate, turning bag once. When ready to cook pork, heat gas or charcoal grill. When grill is heated, remove pork from marinade; reserve marinade. Place pork on gas grill over medium heat or on charcoal grill over medium coals; cover grill. Cook 15 to 20 minutes, turning occasionally and brushing with marinade, until pork is no longer pink in center. Discard any remaining marinade. 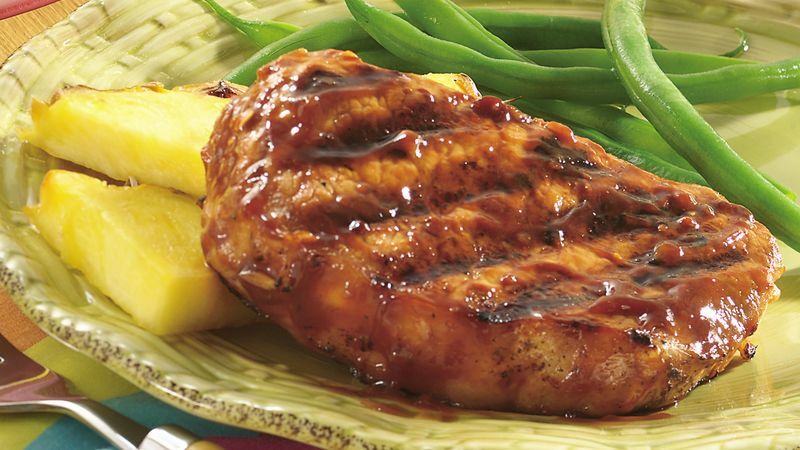 Serve these pork chops topped with pineapple slices.